Samsung has filed for a trademark on a logo for an unannounced product called Ahead… which seems to some sort of device that you wear… on your head. Get it? Update:As Luigi from I4U reminds me, Samsung did introduce a product called “Ahead” earlier this year. 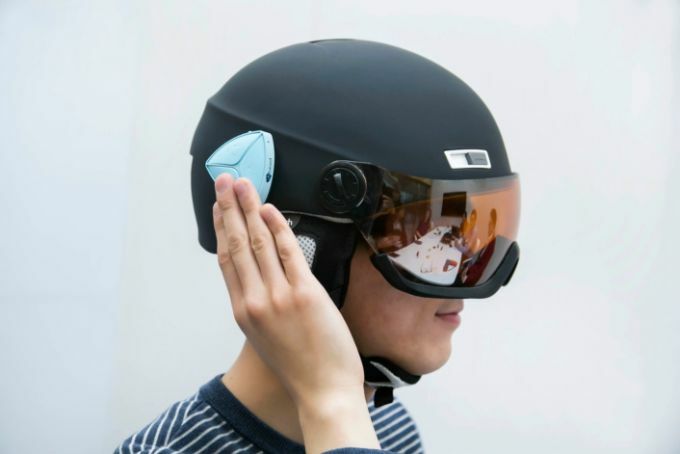 It’s a triangular device that connects to a helmet via magnets, and which pairs with a phone via Bluetooth so that you can make phone calls, listen to music, or interact with your phone in other ways without removing your helmet when you’re riding a motorcycle or doing anything else that involves wearing a helmet. The Ahead comes out of Samsung’s C-Lab incubator, where the company’s employees develop their own side projects. The trademark filing could be an induction that Ahead will be coming to market soon. While the trademark application doesn’t provide a lot of details, Samsung does describe the category of devices which it would apply to, which paints a picture of a helmet with Google Glass-style smart features. For example, the trademark would apply to “wearable telecommunication machines and implements in the shape of a helmet,” and “wearable computer in the shape of a helmet,” as well as “electric audio an dvisual apparatus” such as MP3 players, portable computers, or digital cameras. In other words, if Samsung is granted the trademark and some other company tries to build a helmet with a built-in smartphone, camera, or audio/video player and call it “Ahead,” Samsung would probably be able to take legal action… which suggests that Samsung’s product will be capable of all those things. So what would you use a smart helmet for? I dunno… depends on the type of helmet, I guess. Samsung hasn’t provided any specs or pictures so it’s not clear if we’re talking about something that looks like a motorcycle helmet, a bicycle helmet, or maybe some sort of protective gear that you might wear in an industrial environment, on a construction site, or in a military setting. I have no idea if Samsung Ahead is a consumer-oriented product aimed at sports enthusiasts or an enterprise product aimed at industrial or government workers. But a device that adds an internet connection and audio and visual cues to a helmet you’d already expect to wear on your head in some situations might be an easier sell than Google Glass, which is a wearable device that stood out like a sore thumb because it was meant to be used by people who wouldn’t normally be wearing a headset. Likely more HoloLens than Glass. Not sure it’s ok to give them this trademark when Head could make smart head mounted gear. Sounds a lot like the Headwave Tag, but just smaller I guess?